Learn BPMN the right way. BPMN is the industry standard for business process modeling, whether for simple documentation, analysis, or executable implementation. Today anything else should be considered “legacy” and “proprietary.” But few modelers know how to use BPMN correctly or effectively, able to communicate the process logic clearly, completely, and consistently through the process diagram alone. BPMessentials shows you how. Hands-on practice is essential. Students use a BPMN tool both in class and in the post-class certification period to create models themselves. All channels support the same content, exercises, and post-class certification. The vocabulary of BPMN, focusing on just the shapes and symbols you need to know, including proper labeling and common usage patterns. The Method, a 5-step methodology for translating process information gathered from stakeholder interviews and workshops into Good BPMN that is properly structured and easily understood even by those who do not already know the process logic. BPMN style, additional rules beyond those from the spec, designed to ensure that the process logic is communicated clearly and completely from the printed diagrams alone. Style rule validation is built into the Vizi Modeler tool. The key to BPMN’s expressive exception handling, focusing on the “Big 3” – Message, Timer, and Error – including event subprocesses. 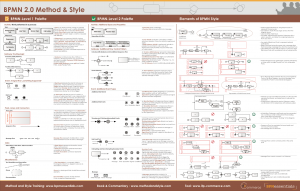 BPMN Method and Style certification demonstrates mastery of BPMN, not only the ability to understand the notation but the ability to create process models following the Method and Style principles and approach. Post-class certification is included with the training; there is no extra cost, and only students who have taken the training are eligible for certification. Students must pass an online exam, and then create a process model containing certain required elements and email it to Bruce Silver for review. If it is not perfect, they must fix the problems and resubmit. This iterative process is where students “really learn” the material. Students have 60 days to complete certification, and are provided a license to the BPMN tool for 60 days; extensions may be purchased if necessary. BPMessentials Live/online training and certification using a cloud/browser-based tool is also available through methodandstyle.com.